Let's say you're looking to plan your next vacation and you start researching online at the various Online Travel Agencies (OTA) which may include starting at Google and then eventually navigating your way to Expedia.com, Kayak.com, Booking.com, Hotels.com, Tripadvisor.com, etc. You start to think wow there are so many choices available online to plan and book your next trip. After looking at all of the options you start seeing various prices for the same room at the same hotel and start seeing a pattern in the choices available to book this hotel. 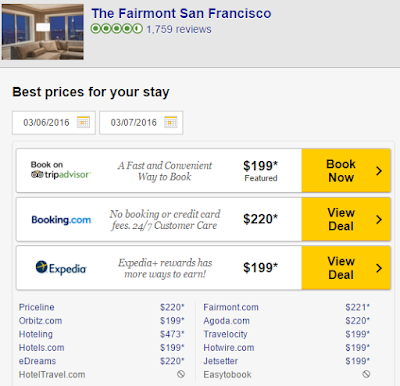 For the example above, there are thirteen options where we can book The Fairmont San Francisco, but only two different price points. Thirteen different sites and only a few different prices? You start to think it must just be a coincidence or is it something else that is going on here? Hotels set the rates for their rooms based on a myriad of factors and sophisticated sets of algorithms to account for profit margins, high/low rates, supply, etc. In the above example you can see that there are mainly two different sets of inventory and there seems to be two companies that have access to these different rates. But wait there are thirteen choices available and I am free to book anyone one of them, but in reality there has been a lot of consolidation in the OTA industry and our actual choices seem to be more limited. The problem is that all of the "different sites" seem to be operating independently, but in actuality they are all owned by a select few companies, which limits the price variations and distribution channels of inventory. By keeping all of these companies separate with their own names and website, travelers feel like they're offered lots of different choices and might believe they’re being diligent shoppers by checking Expedia, Hotels.com, Travelocity, and Priceline, when in fact, they’re price comparing figures from the same and sometimes limited sources. The average traveler likely doesn't realize that when they book a deal on Travelocity, they are actually booking through Expedia and that lots of the travel deals you see on Expedia and Travelocity will be the same or very similar. When it comes to OTA's, there are two main competitors, Expedia vs Priceline, with TripAdvisor and Google also looking to become even bigger players in the OTA world. I plan on discussing the travel ambitions of Google in a future post. TripAdvisor is slowly becoming a bigger player, with more of a focus on reviews, comparisons and their fairly new Instant Booking option. www.airfarewatchdog.com, www.cruisecritic.com, www.familyvacationcritic.com, www.flipkey.com, www.thefork.com, www.gateguru.com, www.holidaywatchdog.com, www.jetsetter.com, www.oyster.com, www.seatguru.com, www.smartertravel.com, www.tingo.com, www.travelpod.com, www.vacationhomerentals.com, www.viator.com, and www.virtualtourist.com. 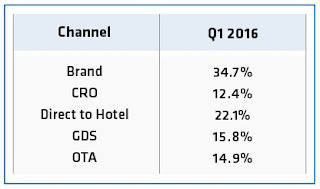 According to TravelClick, the percentage of hotel bookings by OTA's continue to increase year over year. 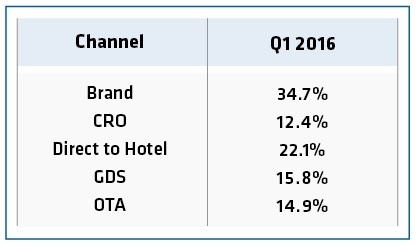 From the data provided by TravelClick, we can see that booking directly with the hotel at their websites (Hyatt, Marriott, Hilton, etc) accounts for a large part of the hotel booking channel and this is the method most hotels prefer you to use, but OTA and GDS (travel agent) bookings have been steadily rising year over year when you look at the data. All of this consolidation helps strengthen the OTA companies and as they continue to gain market share the OTA industry consolidation will lead to less choice and in turn higher prices...eventually? As they continue to get larger and gain market share, they will have greater negotiating power with hotels on commissions and how/where they show up on searches on their respective sites, which in turn may slowly lead to higher prices for travelers. In the short term and in my experience, hotel prices seem to vary more with the date and occupancy rate of a property rather than which booking site you use. Sometimes, a particular site may work a deal with a hotel chain, and you'll see a huge discount or if you are flexible about where to stay, you might stumble onto a great deal. But more often, your travel booking choices as you believe them to be are actually just an illusion. 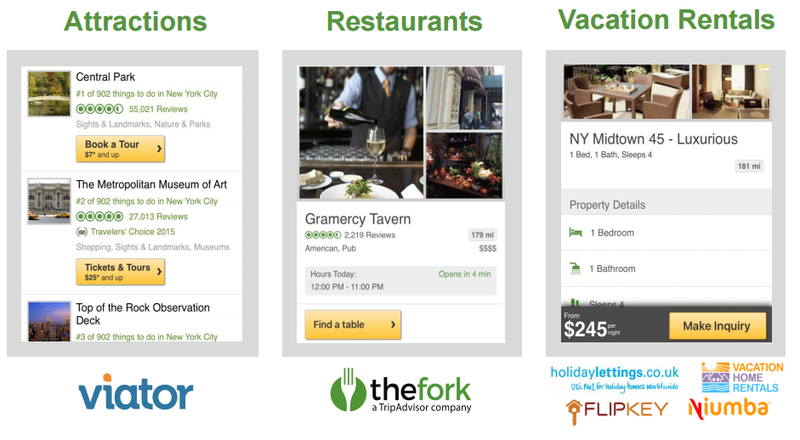 Even with this industry consolidation in OTA's, there still can be a lot of other choices available out there. I plan on discussing my tips on booking hotels with the positives and negatives of each option and how you can sometimes extract more value for the same price by knowing where (and how) to look for your trip.